When it comes to catching fish there are all sorts of tricks to the trade. The mystery behind when and why a fish will bite is debated among fishermen across the world: the time of day, the creek's water level, the fly used. But what if it's much simpler to become a good fisherman than we're making it out to be? What percentage of fisherman out there were wearing their fly fishing clothes since they could toddle? Our bet? Not many. 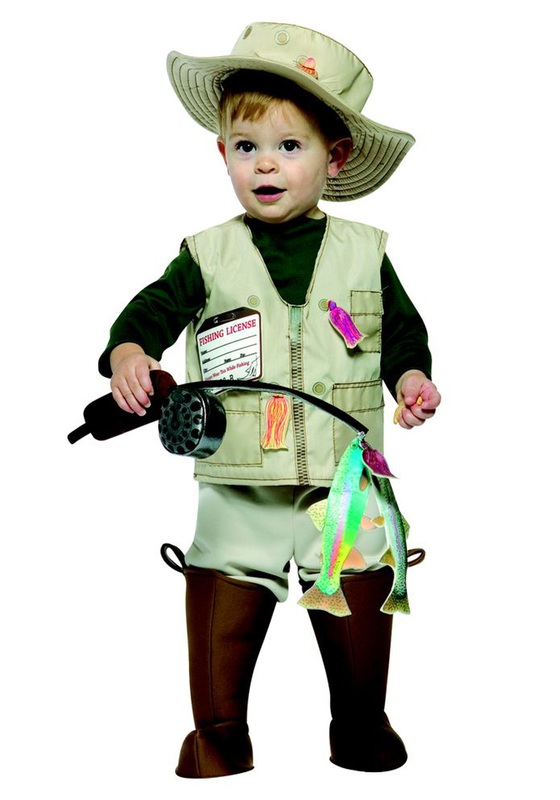 Your toddler may not be ready to brave the cold mountain streams where the best rainbow trout reside, but there is no reason you shouldn't dress them for the job they're going to want. This costume is sure to be a hit at your neighborhood bait shop, you may even get a few free flies out of the deal. There is also a felt fishing license sewn to the front of the vest, just so your child starts off above board. Whether you're going to Grandma and Grandpa's cabin for the weekend or going to the national fly fishing competition your little angler will catch eyes and bait responses where ever he goes. Donning this fisherman outfit may have significant future consequences for your child. He may have one of those "Gone Fishing" signs at a much earlier age than most children. He may also be uncannily good at tying knots and casting a line. Just remember us in a few years, when you're watching your future fisherman reel in his first rainbow. Cheaply made the hat is too small does not fit on the child's head too thin of material. I am very disappointed in this product for the price. My grandson is 19 months we bought the 3t./4t and the shirt fits like a 6 months shirt would. But yet the vest was big. The rod was material. The whole outfit very very cheap and for 44.95 I am returning it.